Lots of interesting interviews this past month – both in print and on video – with the talented men and women who’ve enriched our lives by creating memorable album cover art, including artist of the macabre Jeff Gaither, art directors Mike Salisbury, Kosh and David Larkham, illustrators Shepard Fairey and Tony Quick (for the NEW Zombies LP) and singer/songwriter/painter John Mellencamp. In the fine art book category, there was news of new and upcoming book releases from photographer/collector Raj Prem, the aforementioned Shepard Fairey, photographer Jay Blakesberg (a book titled Hippie Chicks) and videographer/vinly lover Eilon Paz, who brings his Dust And Grooves series from video to print. There were a large number of exhibitions and shows built around rock-related imagery that premiered during October, with shows in museums and galleries around the world displaying collections that show a broad range of album art and related imagery. You’ll read more about current and just-completed exhibits such as the show at Hilton|Asmus in Chicago featuring photos by Henry Diltz, Carinthia West and Pattie Boyd, Neal Preston’s recent display at the LDI convention, the “Hippie Modernism” show at the Walker Art Center, a show of Michael Cooper photos in London, Graham Nash’s new display at the Rock & Roll Hall of Fame in Cleveland, Winston Smith’s collage show in San Francisco, musician/artist Wayne Coyne’s display in Baltimore and a show featuring “make believe” album art in New Haven, CT.
Other interesting articles appeared on subjects including the now-open voting for Art Vinyl’s yearly “Best Art Vinyl” awards, album art created by working musicians, a clothing license deal that will produce gear featuring 80’s style/art icon Patrick Nagel’s artwork, a scientific study into whether album cover art influences the reviews by music critics and three films – Roddy Bogawa’s look into the life and career of the late Storm Thorgerson called Taken By Storm (covers for Pink Floyd, Led Zeppelin and many others), one about photographer Robert Frank (Exile On Main Street for the Rolling Stones) and Colin Hanks & Co’s loving tribute to the life and death of that former temple of all things vinyl – Tower Records – titled All Things Must Pass. As it typically the case, I don’t have the time/space to include everything in this summary, so please take a moment to dig through the rest of what’s below – I’m sure you’ll find something that stimulates your interest! We’re going into the annual voting season for the ACHOF and, as part of that effort, I’ve added several new biographies to the Artist Bios section on the ACHOF site during the month. With our next class set to be inducted before the Holidays this year, I’m working to include as many as possible for consideration in this effort. With all of the year-end distractions soon upon us , I’m going to do what I can to help you in your efforts to catch up on recent news you may have missed but, as I repeat (incessantly, I know) every month, regardless of how hectic your lives may be, there’s no reason that you should go without getting yourselves up-to-date info on one of your favorite topics, so you can be sure that we’ll continue to work every day (except weekends) to prove to you that there’s always something new to see and learn in the world of album cover art, and you know that you’ll find it all here on the ACHOF site (keep your eye on our News Feed for the latest updates). 2) The Walker Art Center in Minneapolis, MN has a new exhibit that presents – through examples of art (including images created by several of the better-known poster/album artists of the era), design, architecture and other popular culture artifacts – how the counter-culture of the late 1960s – early 1970s impressed itself on all aspects of life at the time. Beginning October 24th and running there through Feb. 28th of next year, “Hippie Modernism; The Struggle For Utopia” puts on display ” a broad range of art forms and artifacts of the era” and “features experimental furniture, alternative living structures, immersive and participatory media environments, alternative publishing and ephemera, and experimental film. Bringing into dramatic relief the limits of Western society’s progress, the exhibition explores one of the most vibrant and inventive periods of the not-too-distant past, one that still resonates within culture today.” The show is curated by Andrew Blauvelt, with more info available on the museum’s site at http://www.walkerart.org/calendar/2015/hippie-modernism-struggle-utopia. Anyone who has spent time digging through bins there should get a kick out of reliving those moments in this film. October 15th – 1) I’m not sure whether it is because I spent a number of years creating programming for young people or, more likely, I’m still a juvenile at heart, but I sure love them Minions…Because of happiness these pill-shaped characters bring to me every time I see them, I was even more happy to see them in this new application – featured characters in a series of heavy metal album cover recreations! If you click on over to Greg Kennelty’s article on the Metal Injection site, you’ll learn more about a DeviantArt page hosted by the “Croatian Crusader” where you’ll find his collection of covers for his imaginary “Iron Minion” band based on the well-known designs of seminal metal band Iron Maiden. I can only assume that, somewhere on the interwebs, there’s a site where you’ll find famous punk covers featuring the Seven Dwarfs. 2) Speaking of Belles – there was a special presentation the week of October 20th at Help of Ojai’s Kent Hall (in Ojai, CA.) done as part of the monthly meeting of the Ojai Photo Club featuring musician and photographer Chris Jensen who, according to this article by Myrna on the Ventura County Star site, has produced portraits of everyone from “Belles and Brawn to Rockers and Troubadors”. Originally a drummer in local bands, Jensen went back to school in the mid-70s to earn his degree in graphic design and then, in the late-70s, opened a design/photography studio in Salt Lake City, soon taking on projects for a wide range of local clients. News of his talents spread, landing him gigs with subjects including Ozzy Osbourne and Rod Stewart and, ultimately, moving to the LA area (actually, Ventura) to be closer to his client base. Jensen will be providing a retrospective of his career, so click on over to http://www.vcstar.com/ugc/yournews/from-belles-and-brawn-to-rockers-and-troubadors-chris-jensen-talks-about-portriture-at-ojai-photo-club_188823 to get the details. One look at Questlove sitting amongst his collection explains quite a bit, don’t you think (“happy as a ____ in ____” – you fill in the blanks). October 14th – 1) Need to clarify and update my posting yesterday on the death of John Berg – John died this past Sunday due to complications from pneumonia. Since then, I’ve received a number of notes from people that either/both worked with him and/or were mentored by him that expressed their sorrow about his passing and emphasized the long-term impact he had on their lives and careers. Photo by David Gahr, used with permission from Ron Coro. October 13th – 1) It is with great sadness that I must note the passing of one of the world’s most-prolific album cover art directors, former Columbia Records cover guru John Berg. He was 83 and had been suffering with Parkinson’s disease, according to his wife and creative partner, Durell Godfrey. Berg’s portfolio includes credits for over 5,000 (!!) covers, including memorable images for Barbra Streisand (Barbra Streisand Album), Bob Dylan (Blonde On Blonde and Greatest Hits), Jeff Beck (Blow By Blow), Bruce Springsteen (Greetings From Asbury Park and Born To Run) and 14 covers for Chicago (including the most-delicious one – Chicago X – done in chocolate!). 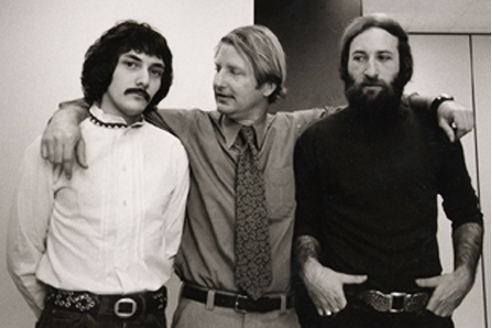 What was truly impressive about Berg’s work was his ability to find and collaborate with the most-talented photographers, designers and illustrators available, bringing the talents of people including Richard Avedon, Paul Davis, Milton Glaser, Jerry Schatzberg and many others to projects for hundreds of clients over the years. My condolences to his family and friends – his efforts will not be forgotten. 3) Not sure exactly why I wouldn’t want to make Grace Jones mad at me (other than the feeling that I think she could snuff me out rather quickly), but fear of her wrath seemingly did not deter self-proclaimed musical genius Kanye West from “honoring” Ms. Jones’ earlier contributions to album cover imagery by recreating them – without her approval – in his own promotional imagery (featuring his then-girlfriend Amber) when he launched his web site several years ago. This did not escape Grace’s keen eye and, in Paper Magazine‘s Nowstalgia issue, she minces no words – “‘Kanye has been ripping off stuff from me and Jean-Paul Goude for a long time, so it was no surprise to me”. 2) Famed Pop Artist Jean-Michel Basquiat had his own record label 30+ years ago (Tartown Records) and released a single on vinyl by Rammellzee and K-Rob called “Beat Bop” that featured a cover design by Basquiat. Quite rare (you can, on occasion, find original copies for $1K or more), the design is now featured on a fully-licensed, limited-edition (1000) record box that, I’m assuming, will be a “must-own” collectible for DJs world-wide. The winners will be announced on November 19th – congratulations to all of the nominees! 2) The Australian record industry announced the winner in the “Best Cover Art” category for the annual ARIA Awards. The technical award categories are awarded prior to the televised show on November 26th that will feature the principal award categories. Ms. Barnett’s album, which went #10 on the Billboard Album Charts and #13 on the UK Album Charts, also received nominations in the following categories: Album Of The Year, Best Female Artist, Best Independent Release, Best Rock Album, Breakthrough Artist and the publicly voted categories for Best Australian Live Act and Best Video for the song, ‘Pedestrian At Best’ which was directed by Charlie Ford. Also – can someone help with a more-detailed definition of the word “meme” than I seem to be able to find? October 7th – 1) Happy to announce the launch of a new retail site by award-winning (inc. 3 Grammy Awards) album cover designer Kosh, the guy responsible for at least ONE BILLION of your favorite album cover images (OK, I may have exaggerated a bit, but it’s a LOT of them). What’s even more impressive about the designer’s latest efforts is that they include a number of impressive re-interpretations and “mash-ups” of some of his better-known covers. I’m particularly taken by one titled Abbey Hotel, a work that combines aspects of both The Eagles’ Hotel California with The Beatles’ Abbey Road (in real life, traffic would have to stop until the Fab Four reached the other side of the cross-walk). You may recall my recent interview with David Larkham about his long-standing creative collaboration with Elton John and the many album cover projects they worked on together. What I neglected to mention was that there were a number of such partnerships that produced many of our favorite images for record packages (and merchandise, stage sets, music videos, etc.) over the years. Other examples include historic couplings such as Pink Floyd and Hipgnosis, Anton Corbijn and U2, George DuBose and The Ramones, Peter Travers and The Moody Blues, Roger Dean and YES, Cal Schenkel and Frank Zappa, James Marsh and Talk Talk and many others. These examples help illustrate the importance of the establishment of a “shared vision” between a musical act and the person/people entrusted to build a visual identity for that act and, once that synergy has been established, how it can grow into an integral part of how that act is seen – and appreciated – by its fans. One sterling example of such a relationship is that between recent Rock & Roll Hall of Fame inductee Linda Ronstadt and the Grammy-winning designer/art director known as “Kosh”. Since the young designer met the singer in the mid-1970s (after her success with her Grammy-winning country-rock masterpiece, 1974’s Heart Like A Wheel, with design by Rod Dyer and photo by her friend Eve Babitz), the two talented artists have joined forces to release two dozen (!!) great albums, with Kosh and his team winning three Grammy Awards for “Best Recording Package” for their work over the years. The third Grammy was awarded in 1985 for Kosh’s cover designs for Lush Life, the second of three albums of big band jazz-era pop standards, with arrangements – and musical bed – provided by bandleader Nelson Riddle. Released in November, 1984. the immensely popular record quickly became a platinum-seller, with Linda earning a Grammy Award nomination (in 1986) for “Best Pop Vocal Performance – Female” for her rendition of the title song, Billy Strayhorn’s “Lush Life” (while she didn’t win for this particular song, Linda did go on to win 11 Grammys during her illustrious career). The first record in the trilogy of recordings dedicated to “the great American songbook” – 1983’s What’s New – established the now-popular practice of rock singers adding their own unique stylings to the classic tunes of a bygone era, with its commercial and critical success proving the viability of such projects to other artists and record labels going forward. The Lush Life record project would again be honored by the Recording Academy when Nelson Riddle, who died in late 1985, was posthumously awarded a 1985 Grammy Award for “Best Instrumental Arrangement Accompanying A Vocal” at the 28th Annual Grammy Award ceremony in early 1986 for the title track, “Lush Life”.